15,508 others viewed this post. So here’s a funny story for you. I was sick as a dog last week. At around 8:45pm last Thursday (March 17) I decided to go to bed uncharacteristically early to lay in a cold sweat with my fever dreams. I checked Facebook on my phone as I lay there, because I’m addicted to my phone. A message was there about a suddenly bright comet passing by the LMC galaxy right now. I hesitated for about 15 seconds then leaped out of bed, grabbed my camera and tripod and went outside to fire off 16 x 6 second shots @ ISO 3200. 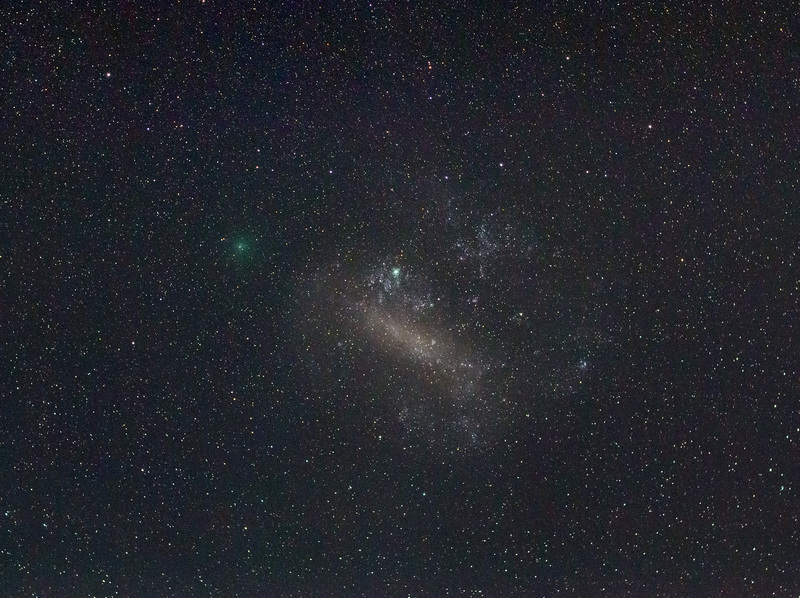 Quickly processing the results and sharing on social media I realised that most people were clouded out that night so my shot was only one of a few of this wonderful pairing of space objects ; a nearby comet and a distant but huge galaxy. The next morning, my photo was picked up by National Geographic! Yes, THAT National Geographic! It’s currently on the front page of their website, and there is a great article about the event by Andrew Fazekas which you can read here! I’m the luckiest photographer ever I think!